FT. LAUDERDALE, FLORIDA (December 11, 2014) – Lots of interesting vessels have been floated on and off DYT Yacht Transport’s semi-submersible ships, but none have been so intriguing as the 126-foot research vessel M/V OCEARCH, which is currently making its way from Port Everglades, Florida to Brisbane, Australia onboard DYT’s 686’ flagship Yacht Express. The research vessel is the namesake of the non-profit organization OCEARCH, which is globally recognized for its work in the field of ocean sustainability. DYT has partnered with the organization to support its study of sharks and other large predators that are essential to the future of the marine ecosystem. This marks the second time Yacht Express has called on Brisbane and Auckland since its launch in 2007. The M/V OCEARCH, powered by two Cat engines and three Cat generators, features an at-sea laboratory and custom-built 75,000 pound capacity research platform that can lift a 5,000 pound shark along with a team of scientists and crew – with one degree of list, conditions permitting. 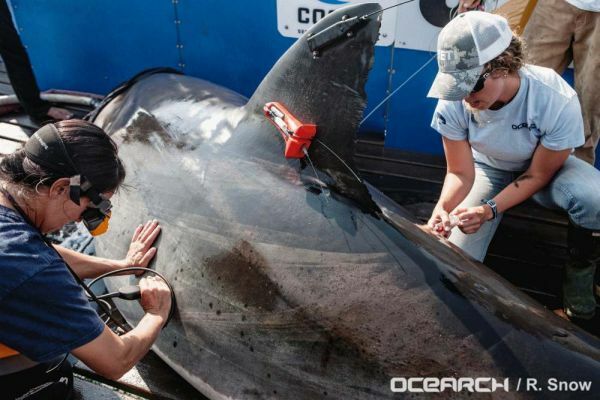 Wanting to make a global impact on the future of the ocean, Fischer began coordinating OCEARCH expeditions that, for the first time in history, brought together fishermen and scientists to tag great whites, tiger sharks and various other species so they could be tracked and their migration patterns studied. Once a shark is tagged, anyone anywhere in the world can follow it in near real-time using OCEARCH’s Global Shark Tracker. The OCEARCH team will begin its research Down Under in early 2015. On December 10, 2014, M/V OCEARCH floated onto Yacht Express, taking her place among other large yachts along the starboard side of the ship’s huge dock bay, for her ride to Australia. To secure M/V OCEARCH, keel blocks were laid out on Yacht Express’s dry deck first, with stanchions and sea stands moved into place alongside. Yacht Express then was “ballasted,” submerging the dock bay so it could flood with sea water, and M/V OCEARCH motored into her pre-determined location and tied off, per the instructions of the DYT Loading Master. Deballasting began when all yachts were onboard, essentially lifting the dock bay of Yacht Express while divers ensured M/V OCEARCH and the other yacht cargo were positioned accurately. When the operation was completed, the deck was dry, the sea stanchions were secured, and M/V OCEARCH was ready for its oceanic voyage.